Just a warning to all considering getting the Nexus One. According to the T Mobile sales rep I spoke with today (1/09/2010) Google is blocking Visual Voicemail on the Nexus. 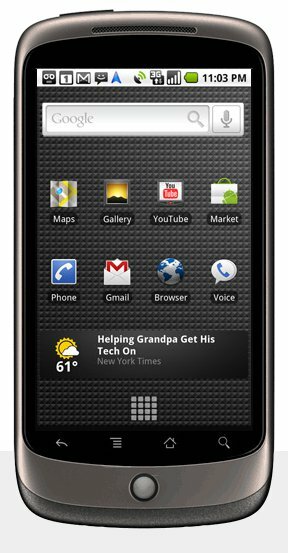 I purchased the unlocked Nexus One this past week and signed up for the Simply Everything Plus plan which includes VVM as a standard feature. Everything on the phone works except for the visual voicemail. I downloaded the application, tried several times and had no luck. I gave up and went to the nearest T Mobile store for help. The employee who was helping me was very kind and we tried calling the T Mobiles customer support and technical support several times and no one had a resolution. It was only after about 45 minutes that she was transferred to Google support that we had an answer. According to the rep, Google is blocking VVM on the Nexus one and suggests that I switch to Google Voice. No F#$%king Way. I am inclined to believe the employee helping me. When the Google support person told her that, she turned white and verified that she heard him correctly. Not only was this news to me, this was apparently news to everyone at T Mobile as well. It is possible that she was mistaken and if I find out more information, I will gladly correct this post. As it stands right now, I am still w/o VVM and it doesn't appear that I will ever have it. I don't like Google having all of my personal information. They have my contacts and calendar, a different company handles my email and T Mobile now handles my voice (after another bad Sprint experience.) No one company should handle all of my information and that is why I am not using Google Voice. I have an account and it seems like a great service, I just don't like that Google is handling it. If you find a workaround, please post it below so I can update this post! Not Activated: You do not have access to Visual Voicemail. Please upgrade your account. Visual Voicemail: Visual Voicemail is available with this phone as part of your data plan for no additional charge. Click below to enable Visual Voicemail on your account. Change Service Result: Your purchase cannot be completed at this time. Please visit My t-mobile.com or call 611 to purchase this value bundle.